Subaru pioneered the luxury 4×4 wagon with the Outback and, thanks to its original concept of building an SUV on a passenger-car platform, it continues to offer an unmatched blend of attributes. 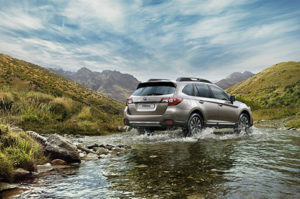 Unlike the segment-busting niche models, which have made the marketplace increasingly confusing, the decidedly different Japanese brand has stuck to its knitting: the Outback is an all-terrain wagon that rides high and is therefore able to offer the consumer the best of both worlds. Some will call it a crossover, others an SUV and a few an all-terrain estate car… It is semantics really. Irrespective of what describes it best, it can be used every day without compromise in terms of comfort and dynamic safety (two areas in which many 4×4s fail) and, when the need arises, it’ll gladly tackle the sort of terrain that sometimes comes with an active family’s lifestyle. It’ll also do so with a high level of luxury, refinement and passive safety – not to forget the ability to tow effortlessly or carry additional sporting equipment and luggage, thanks to the roof rails with integrated fold-out crossbars. 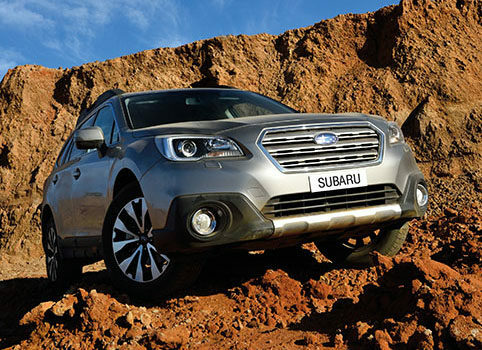 The Outback does exactly what you’d expect and, when it comes to usable functionality, it is hard to beat. If that sounds like a sales pitch from a brochure, then so be it. A week driving one has been a reminder that marketers in the world of motoring have sold the public a number of dummies in recent years, spinning derivatives off the same platform like mosquitoes flying from a stagnant birdbath. And some of them have had a similar lifespan (and appeal and relevance). The Outback – the fifth generation of which was launched locally a few months ago – not only boasts 213 mm of ground clearance, but also combines two key attributes that make it such a genuine all-rounder and not just a show pony. The first is a very sophisticated all-wheel-drive system, which means engine torque is distributed to the four wheels in the ideal proportions to help maintain traction and stability. And the second is the engine itself – what Subaru terms a ‘Boxer’, with the four cylinders laid out horizontally in two banks of two (or three, in the case of six-cylinder engines). This translates into a sedan-like centre of gravity and is key to handling characteristics unlike those of traditional SUVs. Besides benefiting from this low-slung Boxer layout, all three engines on offer (2.5l and 3.6l petrol, and 2.0l turbo-diesel) feature various new upgrades. In addition, they share Subaru’s Lineartronic constantly variable transmission (CVT), which is designed to keep the vehicle’s engine permanently operating in the most effective part of its powerband. This not only improves their driveability, but also results in some impressive consumption numbers, with the turbo-diesel sipping just a paltry 6.3 l/100 km. The first thing you notice about the latest Outback is that it is generously proportioned. You will be tempted to open the electrically operated tailgate and shout out: ‘Hellooo, is anybody home?’ Far off in the distance, you may hear a Labrador barking or a child laughing. As well as acres of luggage-carrying capacity, there’s also exceptional rear accommodation, including sumptuously cushioned reclining seats and legroom to spare. The same applies up front: a wider cabin and a more steeply raked windscreen create lots of space, while a complete rethink of the confluence of side windows and exterior mirrors results in that rare beast in this day and age – a passenger vehicle without a front-three-quarter blind spot. Subaru wanted the new Outback to look and feel more sophisticated. This is underpinned by exceptional build quality (long acknowledged as a Subaru trait), with improved materials, a high level of equipment (including a central touchscreen) and enhanced refinement via better sound-deadening and a host of other detail changes, right down to smaller panel gaps. The upshot of all this is a car that feels and behaves very much like an executive saloon day in and day out (but with the added safety advantage of all-wheel-drive). Yet, when called upon, it can be a crossover or an SUV – all the driver has to decide is what to call it and, more importantly, where to take it.